(Phys.org) —The melting of ice is a familiar process: the ice gradually loses its crystalline structure and becomes a featureless puddle of liquid. Normally, no amount of further heating will bring back the crystalline structure. Experiments by Hiroki Ikegami and co-workers at the Low Temperature Physics Laboratory in the RIKEN Advanced Science Institute have now shown that a one-dimensional 'Wigner' crystal on the surface of liquid helium can be made to repeatedly melt and recrystallize with rising electron density. The researchers studied a one-dimensional system of electrons floating on the surface of liquid helium using an intricate device designed to trap electrons in micrometer-sized channels. In these channels, the electrons adopt well-defined structures consisting of one or several chains with a few hundred electrons each. This arrangement provides an ideal setup for studying the behavior of such one-dimensional systems, explains Ikegami. "Generally, experiments involving regularly arranged chains are difficult because in many materials defects are inevitable. Our system is free from impurities and our sophisticated fabrication technique yields uniform channels to which the electrons are confined." In their perfectly clean system, the researchers could control the number of electrons in each chain, and therefore the density of the one-dimensional crystals. They found that when they increased the electron density in the channel, the melting temperature at which the chains lose their well-ordered structure initially increased, as expected. At higher densities, however, they discovered that the melting temperature decreased, only to increase and then decrease again. 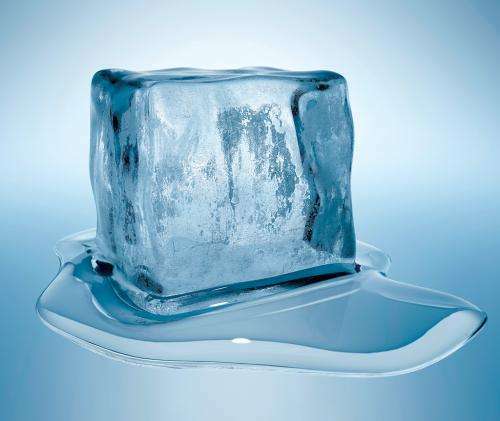 "This sort of 're-entrant' melting behavior has been predicted in computer simulations, but it was surprising for us that we could really observe it in a real experimental system," says Ikegami. The team came up with a detailed model that explains the periodical modulation of the melting temperature as a function of density. In essence, the model suggests that at each melting temperature change, the number of chains in the channel increases. In future research, the team plans to use their microchannel setup to perform quantum computations, in which the chains of electrons would be used to store and process information. "Several schemes for quantum computation using electrons have been proposed," explains Ikegami. All of these schemes require single electrons to be confined to a small region—precisely the purpose for which the device developed by Ikegami and his team was made. "Our technique allows us to confine electrons in one direction, but more technical development is required before we can implement specific proposals."